February 23, 2019 – February 24, 2019 | Daily from 10:00 a.m. to 5:00 p.m. 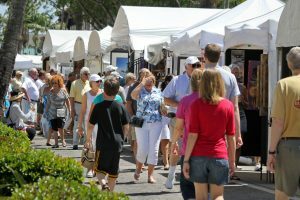 The 40th Annual Naples National Art Festival is held in scenic Cambier Park and along 8th Street South in downtown Naples, Florida. Because of its national ranking and the beautiful weather in southwest Florida during this time of year, the Naples National draws some of the finest artists in the country. Sunshine Artist Magazine has ranked this art festival as high as the number nine art festival in the United States and has included The Naples National in its Top 10 national festival seven years running. This is a juried art festival with artists applying in 18 categories including painting, jewelry, watercolor, ceramics, metal, sculpture and wood. The local community counts Naples National among its premiere, must-see events thanks to the high quality of the art, the engaging personalities of the artists and the festive atmosphere. More than 20,000 residents and visitors flock to this outdoor weekend art festival to enjoy the art, live performances and our world-class restaurants in downtown Naples. Festival attendees take full advantage of the opportunity to meet artists from across the country and to learn about their inspiration and techniques.